Ciudad Quesada Restaurant Guide and Complete A-Z List of Restaurants in Ciudad Quesada. Welcome to this guide to restaurants in Ciudad Quesada as well as bars and cafes located in the town of Ciudad Quesada, Costa Blanca, Spain. Here at Costa Blanca Restaurants we are always being asked – Where are the best restaurants in Ciudad Quesada? I’m visiting Ciudad Quesada on holiday, can you tell me where are the good restaurants in Ciudad Quesada? Where would you recommend to eat out and dine out in Ciudad Quesada? Ciudad Quesada is a popular tourist resort and being close to the Costa Blanca coast you will almost always have a fish or shellfish dish on the menu. Because Ciudad Quesada has such a diverse population with many expats living here there are restaurants catering to many different tastes and nationalities. Cooking standards are usually high and usually include fresh local produce and ingredients. Obviously most restaurants in Ciudad Quesada will be Spanish restaurants many of which will also serve international food or cuisine. The Spanish restaurants will serve tapas, local recipes and dishes that are unique to the Valencian region such as Paella. 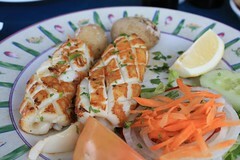 Also expect many meals to be based around seafood dishes due to the Costa Blanca bordering the Mediterranean Sea. Although most Ciudad Quesada restaurants are Spanish owned and run, due to the cosmopolitan population and diverse nationalities of tourists visiting Ciudad Quesada you will also find many Chinese restaurants, Italian restaurants, Indian restaurants and restaurants serving English or British food as well as some Thai restaurants, French restaurants, German restaurants and Japanese (Sushi) restaurants. Look out for the Menu del Dia which most Ciudad Quesada restaurants offer, especially at lunchtimes. This is a great value menu which typically includes a starter, main course, dessert and often includes wine, soft drink or coffee. Now our guide to restaurants in Ciudad Quesada will make obvious the quality places to eat out in Ciudad Quesada – as well as the establishments you probably want to avoid! As well as official comments from the actual Ciudad Quesada restaurants, we also have real restaurant reviews and comments from customers who have eaten out in the restaurants listed below. If you are coming on holiday to Ciudad Quesada no doubt you are wanting to find out the best places to eat out so let us be your guide and get the most out of your holiday in Ciudad Quesada. We also invite you to submit your own comments and Ciudad Quesada restaurant reviews if you have dined out or eaten out in any of the restaurants. If you don’t see a restaurant that you know of in Ciudad Quesada, then please also send us a message with any information you have about the restaurant and we will list it here. We hope you find this free website useful and informative – we would sincerely appreciate any help you can give us – a couple of lines (or more if you like) on any restaurants you know of in Ciudad Quesada would really be very helpful. Consider the following Ciudad Quesada restaurant review factors: the quality and taste of the food and menu, fresh ingredients or frozen, cooking of the chef and kitchen staff, size of portions, the price, the service from your waiter or waitress, the value for money, the decor situation and ambiance, any signature dishes, wines, busy or quiet, any need to make reservations, family-friendly or not. “The friendliest Bar and Restaurant in Quesada! Top food menu using fresh ingredients for a better taste! Floodlit Minigolf Course also for all the family. 2nd round just €1.50! Page Summary: People who are visiting Ciudad Quesada and coming on holiday to Ciudad Quesada want to know where best to eat out. With so many good Ciudad Quesada restaurants available, the last thing you want is to spoil your holiday by dining out at the worst restaurants. Our Ciudad Quesada restaurant guide and reviews will hopeful enable you to pick out the best places to eat out and dine out in Ciudad Quesada.